"You guys keep adding illusions and your show keeps getting bigger and better." 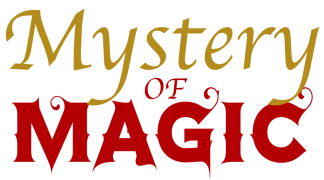 After a successful run in downtown Jefferson City, the Mystery of Magic Theater has closed its doors. Our schedule became very busy this spring and we just couldn't travel to all our shows AND have shows at the theater! Many thanks to our friends of the theater and family for their support! Our shows are still available for private events and we are still performing at various events! 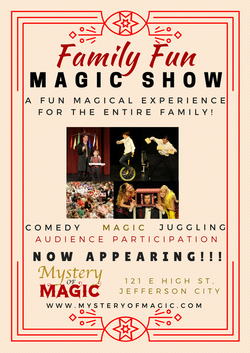 Currently, our next public local show (occurring in Jefferson City) will be at the Miller Center for the Council for Drug Free Youth on April 1st, 2017. 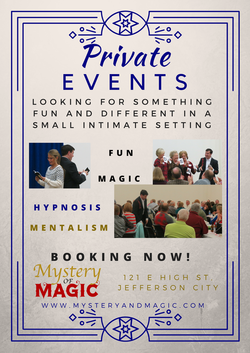 Please call 573-797-0262 to schedule a private event. Looking for something fun and different for an event? 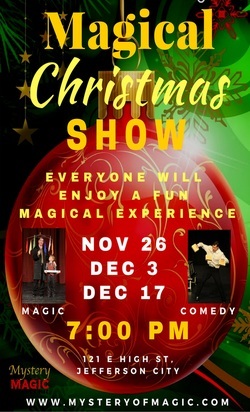 A fun magical experience designed to entertain the entire family.